The new kitchen colors - the door still needs to be stripped and refinished. One of the (very many) discussions Susanna and I have about the house is how to renovate the kitchen. Properly renovating the kitchen is a big project. We need to decide how to allow for plumbing to get to the bathroom that we plan on adding upstairs. The kitchen needs new cabinets (which I would like to build), and we will have to modify the window that goes out to the sun porch (we want to remove the bottom half of the window so we can put a counter under the window. I think we have agreed on a basic layout for the new kitchen – but we aren’t ready to start that big of a project this year. We probably won’t be ready for several more years. Which left us at a decision point. 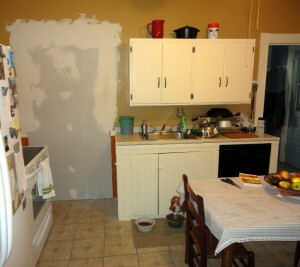 The walls are in pretty bad shape, and the color of the kitchen is pretty ugly. Two weeks ago we talked about repainting the kitchen. We decided to do a quick refresh of the kitchen without doing any major renovations. Susanna and I agreed on colors and got to work 10 days ago. We moved cabinets and a counter out of what had been the pantry and put it in the main kitchen. We knew we were going to lose some storage space in the pantry (we are making it the laundry room). During hurricane Sandy, we both had some extra time (2 days off of work for me, and all week off of school for her), so we made much quicker progress than I had anticipated. Needless to say, we were not bored at all during the hurricane – even when we lost power for 4 1/2 days – we had a generator for light and water, and no power is a great excuse to eat out. I moved the washer and dryer to their new locations in the former pantry. 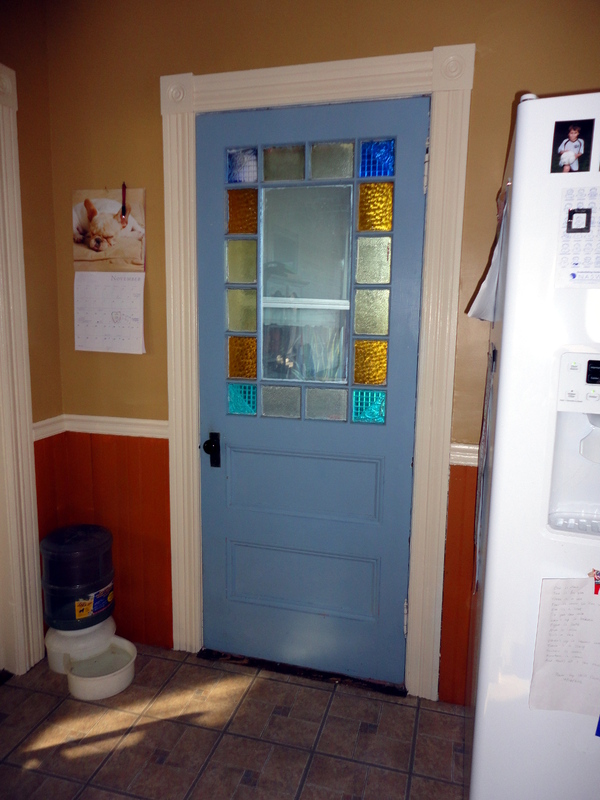 Last weekend we removed the antique trim, and covered up the door to the pantry/laundry room. The entry to the laundry room will be from the mud room/entry area. The plan will be to move the stove in front of the former doorway, and I will build shelves to go in the corner. Once the kitchen is done, the next quick job is to redo the entry way/mud room. My dad will visit for the week of Thanksgiving. If we have time, hopefully we can make good progress on that space. It is small (only 6′ x 8′), but needs the plaster replaced on two of the three walls as well as a new wall/doorway for the laundry room. I also picked up some used hickory flooring to replace the ugly glue down linoleum squares that are still there. The refresh on the kitchen should give us a couple of years before we need to complete the full remodel of the kitchen. The walls aren’t perfect (we just did a quick patch of the wall, no major repairs). The floor is still horrible. We may in the near future decide to replace the glue down linoleum squares with new linoleum squares – we would pick a little higher quality than the tiles that are currently installed. It would be a quick job, not nearly as big of a project as installing proper hardwood floors.